Last night was the launch of Trove’s new Dragon patch. I didn’t have a lot of time to play around with the changes but I was able to complete one of the new challenges. Challenges are presented every hour, directing players to a specific zone in order to complete a set number of dungeons in 20 minutes. There are several tiers of completion—I was only able to finish the base tier of 10, the next tier up was 40—and each one rewards a different number of Azulian dragon caches. These caches contain the crafting materials and consumables required to unlock the new Azulian dragons. You can also get bonus multipliers for using a designated class or participating at the higher difficulty levels awarding even more caches. Participating in the challenge was like being in a swarm of locusts descending upon an unsuspecting field of video game mobs ready for harvest. Once entering an instance, I along with four or five other players all jumped up to the skies, popped our wings, and swooped down on the unsuspecting dungeon bosses. Oh, you’re a boss are you? And you were giving me trouble before, I think? Well I brought a few of my friends this time, pal. You’re dead before my feet touch the ground. It was frantic but fun, and all I could do was hope that I kept up enough to be on site when the boss was killed. Thankfully the game gives you credit for being in the general vicinity. Unfortunately, if you are new to the game you won’t be able to participate in the frenzied mob hazing… mob until you get your mastery rank up to 30, but if you are at least level 10 (the level required for Uber 1 worlds) and can keep up with others doing the challenge, you will level your character insanely fast from all the XP received from downing bosses. After all the fun was had, I managed to get the first tier of rewards and my first two dragon caches. Unfortunately I didn’t get the Dragon Soul needed for the base dragon pet, but what I did receive was still extremely valuable— 1000 flux and 45 eyes of Q’bthulhu—both of which are great crafting mats. With that many eyes on top of what I already had squirreled away, I was able to upgrade one piece of gear to shadow level 2. 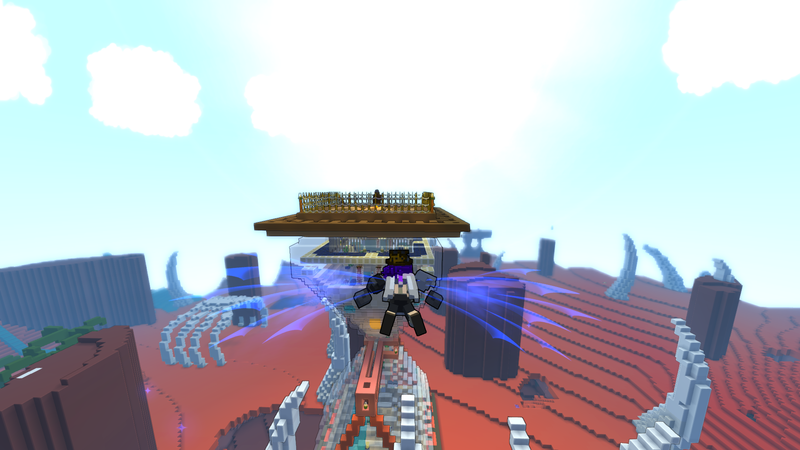 Frantic flying through the frontier biome. That said, I also think it will get old in time. I like the idea of challenges, especially ones best completed by groups, but eventually they will need to diversify. Timed challenges can be fun but exhausting. If that’s the only option in a month or two, participation will either decline or become reluctant. I’m not sure what else they could do though. There’s been talk of world bosses so perhaps they will be incorporated, but to be truly different it can’t be more of the same “kill ‘X’ number of bosses in 20 minutes.” Regardless, I look forward to what is available now and eagerly await to see what else Trion comes up with for future challenges. I’m looking forward to joining. I’m going to wait until it releases in a couple weeks though. Gives me enough time to get my current games finished and out of my system. Sounds good, we’ll be waiting. Four bloggers have joined the club world so far. I’m looking forward to launch. There’s still more being added between now and then (including a necro class, woot!) so it should be really well developed by July 9th. What else are you playing right now? I’m playing a little SWTOR too, but mostly Trove. Was some SWTOR but I’m waiting for my brother to be ready to play it now. So I’m enjoying space engineers at the moment. It’s scratching that modders paradise itch I’ve been looking to scratch.